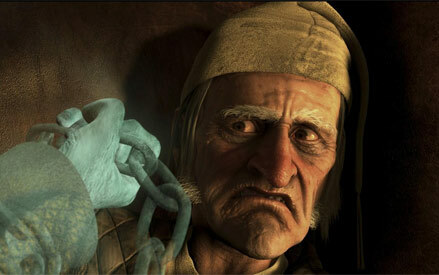 By now, everyone should know the tale of A Christmas Carol, whereby a mean old man named Ebenezer Scrooge is visited in the night by three ghosts who show him various scenes from the past, present and future in order to change his dismal outlook on life. The original novel was written by Charles Dickens back in the 1800s, and though I've never read it I can't imagine it's all that different from the hundreds of variations I've seen on television and in movies. It's a wonderful story, which is why practically every television show has done some kind of variation on it. But this also means it has been done to death, which is why my wife and I didn't go see the new Disney's A Christmas Carol staring Jim Carrey when it was playing in 3D at our local theater. On the DVD, we get most of those bonus features. The only one that's really missing is the Behind the Carol. That's a pretty good array of bonus features considering they're all on a single disc along with the movie. And our DVD player upconverts to high-def, so the movie looked fantastic even just watching it on a normal DVD as opposed to Blu-ray. That's actually one of the reasons we haven't gone to Blu-ray; why spend the money when an upconverted DVD looks almost just as good? Anyway, let's get to the feature film. This is a 3D computer animated adventure, and the graphics and animation look great. All the characters are kind-of photo-realistic, though they are made slightly distorted and exaggerated. To me is made all the characters seem really creepy, so I'm not sure why they choose to go that route, unless that was the point. 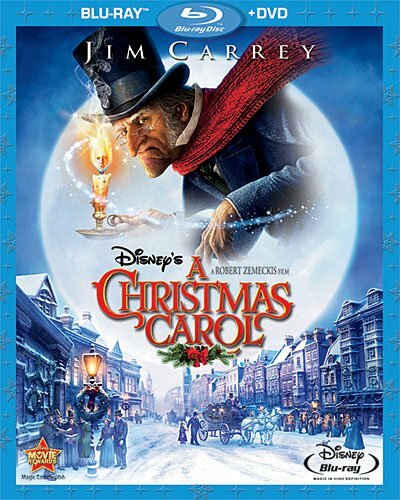 This movie is supposedly closer in theme to the original book than all other animated iterations before it, and apparently the book is darker than what what we're used to when we think of A Christmas Carol, so maybe this was the intent. Since I haven't read the book, I couldn't tell you. What I can say is that while the graphics were technically fantastic looking, I really had a hard time connecting with any of the creep-looking characters. Now the dialog sure sounded like it was taken straight from the book, as it used a lot of that old-timey language that's difficult to understand. We had to put on the subtitles just to figure out what they were saying, and even then sometimes the dialog went right over our heads. So that also made it hard to really get emotionally invested into the characters and story. And on top of all that, the movie seemed to move quite slow. There were several scenes I saw where I thought to myself that they could have cut them down and got on with it. All this adds up to a fairly dull experience with a story that we've seen countless times before. I love the Disney version with Scrooge McDuck, and I love the Bill Murray version called "Scrooged", and I've enjoyed many other adaptations such as the Muppets or various television shows, but this version right here really didn't do anything for me. It seemed like the only thing this added was special effects, such as where Scrooge shrinks down to a miniature size and has a pointless action chase thing before getting to see future events. Was that really in the book? What was the point? Anyway, neither my wife nor I really enjoyed this film. It put her to sleep early on and I had to really focus to not drift off myself. I knew what was going to happen to Scrooge, and I didn't really care, nor did I can about any of the other characters and what they were up to. Maybe it was better in 3D, but I doubt that would make up for a dull movie.